Impress your friends with five fast facts about artist Janet Forrester Ngala (b. 1936), whose work is on view in NMWA’s collection galleries. 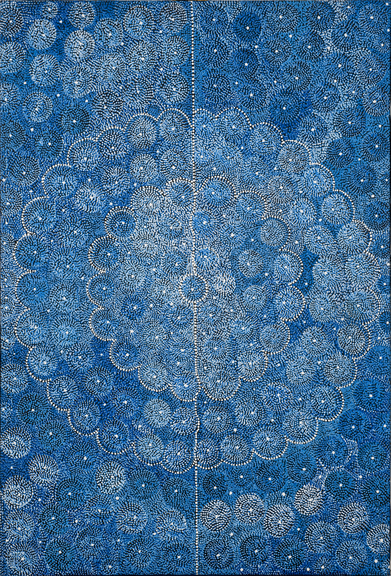 Janet Forrester Ngala, like many other Australian Aboriginal artists, depicts Dreamings, or creation stories. As these tales are inherited and considered sacred, artists protect specifics by working in an abstract style. Australian Indigenous art dates back more than 30,000 years. Early forms of expression included rock, bark, and body painting and ephemeral ground drawing. In the 1970s, Aboriginal men started using modern art materials to record ancient stories in tangible, saleable forms. Many women, including Ngala, began painting in the 1980s. Ngala frequently represents the Milky Way in her paintings. Australian Aboriginal people believe that the galaxy is home to ancestral spirits and that each star within it represents a deceased person or animal. 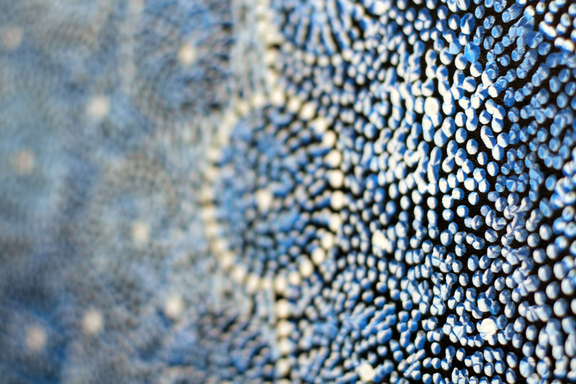 Ngala’s Milky Way Dreaming (1998) invites viewers to imagine gazing up at the stars. In Yam Story ’96 (1996), Emily Kame Kngwarreye (ca. 1910–1996) leads viewers deep underground, where we see intertwined, infinite, root bundles. Pansy Napangati (b. ca. 1948) provides audiences with aerial views of the land. In addition to the Milky Way, Ngala’s repeating symbols include serpents, honey ants, bush bananas, goannas (carnivorous lizards that are close relatives of Komodo Dragons), and witchetty-mades (large white larvae of moths historically consumed by Indigenous Australians due to their high protein content). This entry was posted in 5 Fast Facts, From the Collection and tagged Emily Kame Kngwarreye, Janet Forrester Ngala by Women in the Arts. Bookmark the permalink.